Intrievex | A better way to find information. 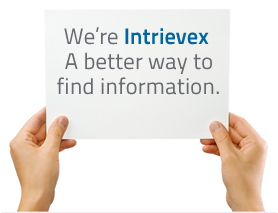 Intrievex is an information retrieval technology and services company. We make the science of document and information retrieval simple, reliable, and valuable for your business. We provide information retrieval tools and services like our intelligently disruptive CourtsOnline, to industries including legal, title, real estate and medical. Our proprietary and unique technology is easy to use, secure and the most cost effective. We make finding information simple through a better search experience, advanced features and a welcoming and modern user experience. Discover why there's now a better way to find court case records. We believe that a search experience should be easy and simple, and we believe it needs to be faster and more inexpensive. With CourtsOnline, our customers finally have a better way to find information.